A few days ago, I started a summary of my writing projects this week. And then life got busy. And then something happened. There’s a lot to be said of the recent events here in Paris that have garnished so much media attention around the world. I should probably address it, but I won’t. Instead, I dug through my computer files looking for this essay I wrote last Spring, and then forgot I wrote, and today remembered I wrote. So rather than cataloguing this week’s procrastination techniques in a blog post, or proclaiming “Je Suis Charlie” when I’m not French, I’m sharing this (unedited) essay from April 2014, and I hope it brings a smile. Paris is a unique and beautiful city. Everyone knows this. Its opulence and grandeur are seen from all vantage points; its rich, sordid history screams at passersby while they meander its maze of boulevards and rues; and its allure beckons travelers from every corner of the Earth. To visit Paris is a dream. But to live in Paris is transformational. Before the Grand Déménagement, I spent a week at our apartment in the 17th Arrondissement last November. In that time, a vague mental map took shape in my brain. While I was far from familiar with my local quartier, I realized I soon would be, and I didn’t stress about it. My mind soaked in the newness of novel sights and sounds – the beauty of ornate limestone carvings on every building, the buzz of scooter motors along every street, the reflective puddles of water on the sidewalks under my feet – and I was filled with wonder. After arriving permanently in January, I spent entire days walking. 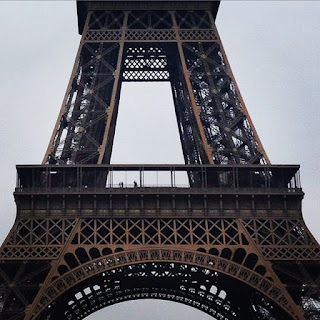 I explored museums, book stores, markets, gardens, restaurants, parks, and quais. I observed the Parisian people and all their quirky habits and unfamiliar fashion. I embraced the culture and the language and I thought – ignorantly – that I could eventually become a Parisienne. By March, I had traveled to 8 European countries, and each time that I returned to my apartment in the Dix-Septieme, I felt more and more like I was coming home. Then in April, I visited the USA. Now I ask myself: Where is home? For in this exact moment, I need to consider Paris my place of residence. It took me nearly 4 months to get a titre de sejour, so I better call this the city where I reside. But it’s about more than a boulevard (Malesherbes) and a Metro station (Wagram). Mentally, calling Paris my home is the only thing that really puts me here. It makes me act as though I belong. As if it’s where I was always meant to be. My feet have pounded every square mile of this city. They’ve marched along the pavements, the gravel, and the cobblestones. They’ve climbed countless circular staircases and stood on sites where people were once beheaded and celebrities were buried. My feet have waited patiently for the little green man at intersections; they’ve tapped along to accordions, cellos, and boom boxes in the Metro; and they’ve stood for many collective hours in the queue. My wandering ways have made Paris mine. And yet. Every time I step onto the street, I see something new. It’s like looking at the starry sky on a clear, moonless summer night. The longer you stare, the more you see. What starts as a few dozen big bright stars suddenly morphs into hundreds, and then thousands, and if you stare long enough, so many millions and millions of stars that it will take your breath away. This is exactly what happens to foreigners in Paris as they slowly realize this city is now their home. First, you start noticing the interiors of apartments when they are lit up at night. Then, you begin to see office workers sitting at their desks, typing on their computers or talking on their phones. Next, you notice little stores curiously placed between big stores, and then you start to read the graffiti scribbled on the sidewalks and the movie advertisements at the bus stops. You pick up the free papers at the Metro stations, and the articles (in French) somehow make sense. You avoid the sidewalk in front of any school during arrivals and dismissals. You overhear someone on their mobile phone say, “I’ll meet you at the finger,” and you know what that means. You catch a smile from your grocery checker. So what did I notice when I returned to Paris after my first trip home to the USA? It wasn’t the petite people or the quiet talking or the incessant smoking or the dog poop. That stuff is for amateurs. I noticed the Chambre de Bonne. During the past few weeks, while pounding the pavements of Paris, I found myself constantly looking up and asking: Who lives behind those tiny windows along the tops of Haussmann buildings? It’s a rhetorical question. The standard answer is “students.” But can there be that many – literally thousands upon thousands – of students living in Paris and hoarding all the chambres de bonne for academic purposes? Surely, there are all kinds of displaced and budget-conscious citizens taking up residence in these pint-sized apartments, formerly reserved for maids. And while I’m especially glad I’m not one of them, I find it fascinating how in any single Haussmann building, the upper echelon of wealth and status (usually on the 2nd and 3rd floors) lives precariously close to those who are only three steps removed from homelessness, or at the very least, from moving back in with their parents. In the middle of the night, I hear people moving around on the floors above me. Last night at 1 am, a young woman caused a ruckus when she entered our courtyard, fumbled with the door code, ascended seven flights of stairs in heels, slammed a door, clanked around for a good ten minutes, and then presumably fell into a drunken slumber. I thought to myself, she must have such a little room all the way up there on the 7th Floor. There was a brief period of time not so long ago when an average of 55 people per day were guillotined near the mass graves at Picpus in the 12th Arrondissement. I probably shouldn’t mention that, right? But I’ll bet if you had a chamber de bonne during that time, it was a decent location to fly under the radar. So at least you could keep your head intact. And then it dawned on me. Paris is my Chambre de Bonne. PS - I’ve successfully submitted my third short story to a third literary publication this year, which keeps me on target for 52 submissions in 2015. This week’s story is called Snakeheads and I sent it to The Boiler Journal. I’m sort of cheating since it’s a re-write of a short story I originally crafted like 8 years ago. (Seriously)? (Eight years ago)? (I’m not old, I swear).